Apparently enough was enough. Two coaches lost their jobs Monday morning, as Washington Head Coach Bruce Boudreau and Carolina’s Paul Maurice each lost their jobs. Given the recent play of each team, neither was particularly surprising, but in my opinion, only one was justified. In the vast majority of cases, I believe that teams play poorly because they’re poorly constructed; they lack scoring, goaltending, consistency, or some other key element. In other words, the team’s General Manager has failed at his job. This is certainly the case in Carolina, where the Hurricanes were widely expected miss the playoffs. (I had them finishing in the bottom 5 in the East). GM Jim Rutherford made off-season moves which didn’t address the team’s needs, bringing in marginal, 3rd tier forwards like Alex Ponikarovsky and Anthony Stewart, and overpaying for Tomas Kaberle, a defenceman in decline. Unfortunately, apart Cam Ward, Brandon Sutter, Jeff Skinner, and Eric Staal, there just isn’t much talent on that roster. And with so few solid contributors, I think it’s a stretch to believe that a coaching change will turn the fortunes of this team. But a coaching change is easy to do, and so it was done. But there are occasions when coaching changes are merited. In Washington, the team was, and is, expected to compete for the Stanley Cup, and has more than enough scoring, defensive depth, and goaltending acumen to be considered among the 5 best in the league. But after a magnificent 7-0 start to the season, Boudreau’s Caps went 3-9-1, sending taking them all the way from 1st in the league to 18th overall. And it wasn’t just their play this season that tempted GM George McPhee to make the switch. For years, the Caps have been sensational during the regular season, and incredibly underwhelming come playoff time. Despite four consecutive division titles from 2008-2011, which saw them win 37, 50, 54, and 48 games, the Caps never made it past the 2nd round of the playoffs, and were twice eliminated in the 1st round. And while it’s hard to fire a coach who won 189 games in under 4 seasons, McPhee saw the season slipping away, and decided that a new voice might get more out of his struggling roster. So how often do coaching changes work? Well, not very often. Long-time bottom-feeders like the Atlanta Thrashers, Florida Panthers, Columbus Blue Jackets, and New York Islanders have taught us that a revolving door of coaches isn’t the answer. And in most NHL cities, a coach is lucky if he finishes his contract, which is typically three years long. But there are a few cases where a change of leadership made all the difference. It doesn’t really take guts to fire the coach of a struggling team, but how about firing a coach when the team is 41-20-13, and sitting 1st in the Eastern Conference? That’s exactly what Lou Lamoriello did in 2000 when he fired Robby Ftorek and promoted former Hall-of-Fame defenceman, and then assistant coach Larry Robinson. The early returns weren’t good, as Robinson started off with a record of 4-4-0. But in the end Lou’s gamble paid off, as Robinson led the team to their 2nd Stanley Cup, winning in 6 games over the ’99 cup champ Dallas Stars. In 01-02, the Mighty Ducks finished tied for the 4th worst record in the NHL. As a result, Bryan Murray left the coaching ranks and took up the role as GM, and hired Mike Babcock, who had been coaching the team’s AHL affiliate in Cincinnati. During the regular season, Babcock helped the team make a nice turnaround , finishing 7th in the Western Conference. For his trouble, his team earned a 1st round match-up against the Detroit Red Wings – the 2002 Stanley Cup champions. Unperturbed, the Ducks were excellent in the role of David, as solid defence and miraculous goaltending from J.S Giguere saw them sweep the defending champs in one of the most memorable upsets in playoff history. Anaheim went on to beat 1st place Dallas in 6 games, and Minnesota in 4 straight before losing to the New Jersey Devils in a tightly contested 7-game series. While J.S Giguere was the obvious hero, taking home the Conn Smythe as playoff MVP, many people credited Babcock with getting the absolute most out of a team who most expected to win no more than 1 or 2 playoff games, rather than 15. The Red Wings especially took note, and hired him to coach their team just two years later. He’d go on to win the Stanley Cup with Detroit in 2008. Bolstered by the young duo of Kane and Toews, and a talented blueline led by Duncan Keith and Brent Seabrook, Blackhawks GM Dale Tallon expected his talented young team to rise to the top of the hockey world. But after a 1-2-1 start, Tallon fired Head Coach Denis Savard, just four games into the season. To mould the young minds, he hired Joel Quenneville – a man with over 10 years of head coaching experience with St. Louis and Colorado. Quenneville promptly guided the young Hawks to a 45-22-11 record, and took them all the way to the Western Conference Finals, where they lost to a veteran Detroit Red Wing squad. The following year, the Hawks completed their ascension, capturing the Stanley Cup in 6 games over Philadelphia. Most of the attention was paid to the team’s stars, like Duncan Keith, who won the Norris as top defenceman, Jonathan Toews, who captured the Conn Smythe Trophy as playoff MVP, and Kane, Sharp, Versteeg, Bolland, Seabrook and Byfuglien, who were all instrumental in the victory. But there’s no doubt that Quenneville provided much needed guidance to a young group that was teaming with skill, but short on experience. After taking the Pens to the Stanley Cup final in 2008, coach Michel Therrien was fired 57 games into the following season. His record at the time was 27-25-5, and many were struggling to understand how a team so talented could be playing so poorly. And then along came Dan Bylsma, and just as a Phoenix rises from the ash, the Penguins rose to glory. Under Bylsma, the Pens did a complete 180, going 18-3-4 to end the season. They ran over Ottawa in the 1st round, won a tight 7-game series against Washington in round 2, swept Carolina in the Conference Final, and beat Detroit in an epic 7-game series to win their first Stanley Cup in the post-Lemieux era. These days, Bylsma is regarded as one of the best coaches in the NHL; in fact, he was awarded the Jack Adams Trophy as Coach of the Year last season, as he guided the Pens to 49 wins despite losing both Evgeni Malkin and Sidney Crosby for half the year. And the cherry on top: Bylsma was drafted by the Winnipeg Jets, way back in 1989. 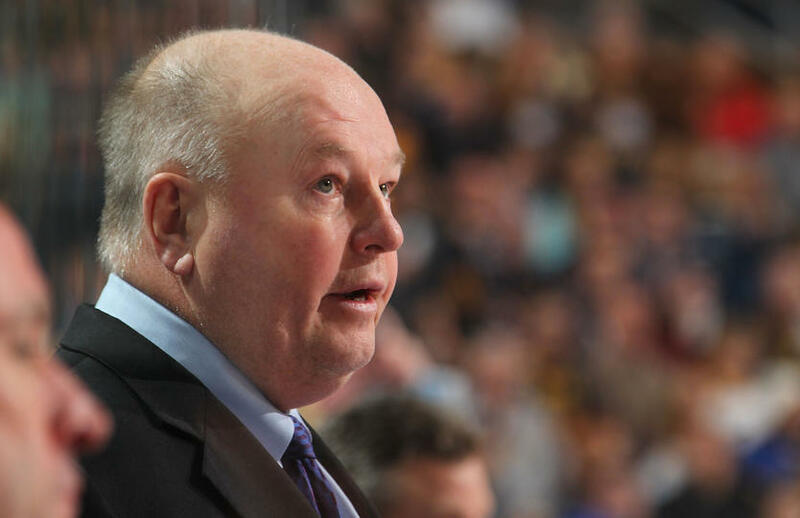 This entry was posted in Uncategorized and tagged Boudreau fired, Bruce Boudreau, Bruce Boudreau fired, Carolina coach fired, coach Boudreau fired, Dale Hunter, Dan Bylsma, Joel Quenneville, Kirk Muller, Maurice fired, Mike Babcock, Nhl coaches fired, NHL washington coach, Paul Maurice, Paul Maurice fired, Washington Capitals fire coach by Peter Siamandas. Bookmark the permalink. Early potential addition to that list is Ken Hitchcock in St. Louis this year. Davis Payne wasn’t getting it done with a team that has the talent to compete in a tough Western Conference, but since Hitchcock came to town three weeks ago, the Blues have gone 7-1-2 in three weeks to move from 12th to 5th place in the West. They also have 17 home games compared to only 9 games out of town from now until the end of January. This is important because the Blues are much better at home than they are away. 8-2-1 at home compared to 5-6-1 outside of the Scottrade Center. This could be a very interesting team to watch as the season progresses.